The production of 3D models has been a popular research topic already for a long time, and important progress has been made since the early days. During the last decades, vision systems have established to become the standard and one of the most efficient sensorial assets in industrial and everyday applications. Due to the fact that vision provides several vital attributes, many applications tend to use novel vision systems into domestic, working, industrial, and any other environments. To achieve such goals, a vision system should robustly and effectively reconstruct the 3D surface and the working space. This chapter discusses different methods for capturing the three-dimensional surface of a scene. Geometric approaches to three-dimensional scene reconstruction are generally based on the knowledge of the scene structure from the camera’s internal and external parameters. Another class of methods encompasses the photometric approaches, which evaluate the pixels’ intensity to understand the three-dimensional scene structure. The third and final category of approaches, the so-called real aperture approaches, includes methods that use the physical properties of the visual sensors for image acquisition in order to reproduce the depth information of a scene. 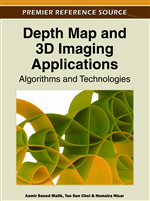 Three-dimensional object and surface reconstruction from images is an important topic in various application areas, such as quality inspection, clinical photography, robotics, agriculture, and archaeology. In the domain of quality inspection, a large number of inspection tasks depend on three-dimensional reconstruction techniques, such as the surface measurement applied to high-precision engineered products such as aircraft wings (J. Xu, Xi, Zhang, & Shi, 2009; J. Xu, Xi, Zhang, Shi, & Gregory, 2010). Tasks of this kind usually require the accurate measurement of depth on small surfaces. Other tasks depend on the precise measurement of a sparse set of well defined points, for example to determine if an assembly process has been completed with the required accuracy, or measurement of the relative movement between important parts during a crash test. Three-dimensional clinical photographs have the potential to provide quantitative measurements that reduce subjectivity in assessing the surface anatomy of the subject before and after a surgical intervention by providing numeric scores for the shape, symmetry and longitudinal change of anatomic structures (Tepper et al., 2008; Janoos et al., 2009). Furthermore, the vast majority of nowadays mobile robots are equipped with one, two or more cameras in order to provide visual feedback in applications like maze exploration, map navigation and obstacle avoidance. (DeCubber, Nalpantidis, Sirakoulis, & Gasteratos, 2008; Nevado, Garcia-Bermejo, & Casanova, 2004; Nalpantidis, Kostavelis, & Gasteratos, 2009; Nalpantidis, Chrysostomou, & Gasteratos, 2009). Besides, in the field of agriculture, new applications emerged recently, such as a mobile robotic system use cameras to reconstruct the surface of the plants to find parasites and report them (Šeatović, 2008; Zhu, Lu, Luo, Tao, & Cheng, 2009). One more interesting application area includes the archaeological excavations and historic objects, where three-dimensional surface reconstruction is applied to many archaeological sites in order to preserve crucial details of the site and use them afterwards for 3D presentation and tourist attraction (El-Hakim, Beraldin, Picard, & Cournoyer, 2008; Remondino, El-hakim, Baltsavias, Picard, & Grammatikopoulos, 2008). The key feature of a vision system is its capability to see or capture portions of the world and to obtain a density of sampling in space and time. This sampling density is essential in several applications. In surveillance, dense sampling of space and time might allow us to track a single pedestrian throughout a complex of buildings. Multiple views of a geometry can be used to obtain 3D reconstructions with appropriate assumptions, camera location and calibration information. Currently, they are used to produce reconstructions of quite complex geometries from a moving camera or from a static multi-camera system inside a room. For example, one might drive a camera through a city and build a geometric model from the resulting video or one might watch a hanging robot inside a seminar room while tracking it from the reconstructed data. Once multiple views establish correspondences, their observations might be used to recover a geometric model as well as a model of the cameras’ current locations. The various application scenarios set different requirements on the reconstruction. In several tasks, it is sufficient to produce a sparse set of 3D points, where 3D information is available only for a very small number of pixels in the input images, while others require a dense reconstruction, with 3D information available for every pixel in the input images. Other important factors include the size, shape, and material of the objects, the number of required images, requirements on positions of the cameras or light sources, and the time allowed for image capture and reconstruction.